Pensando. Espera por favor. (Thinking. Please wait.). Wade M/Creative Commons. Pensar typically means "to think," but it is not always used in the same way as the English verb. Most significantly, the words that follow pensar might not be the ones you would expect. Keep in mind that pensar is conjugated irregularly. When the stem pens- is stressed, it becomes piens-. Thus, the present indicative forms are pienso (I think), piensas (you think), piensa (he/she/you think), pensamos (we think), pensáis (you think), piensan (they/you think). 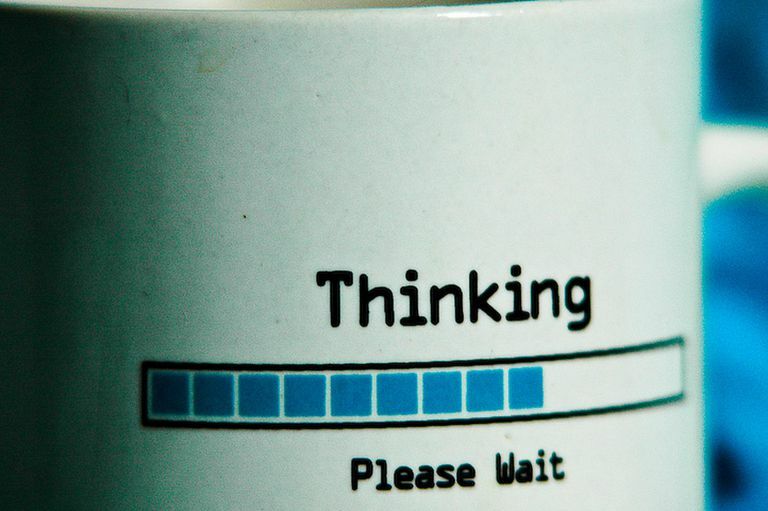 Most frequently, pensar, when used by itself, is the equivalent of "to think." Pensar que is a very common way of indicating opinions or beliefs. It often is translated appropriately as "to believe" rather than "to think." In the positive form, it is followed by a verb in the indicative mood. Note that while que in this usage usually can be translated to English as "that," it often can be left untranslated, as in third and fourth examples. When used negatively, no pensar que is followed in standard Spanish by a verb in the subjunctive mood. It is not unusual, however, to heard the indicative mood used in casual Spanish. Pensar de is another way to say "to have an opinion about." Pensar sobre can also mean to have an opinion about, especially when used in a question. Pensar de is more common. When followed by en, pensar typically means "to think about" in the sense of having one's thoughts focus on something. Note that this isn't the same as using "to think about" in the sense of having an opinion. Pensar sobre can mean basically the same thing as pensar en but is much less common and is probably overused by English speakers speaking Spanish as a second language or when translating from English to Spanish. When followed by an infinitive, pensar is used to indicate plans or intentions. How To Conjugate the Spanish Verb "Pensar"
6 Ways of Using the Spanish Verb "Llegar"
11 Ways of Using the Spanish Verb "Hacer"